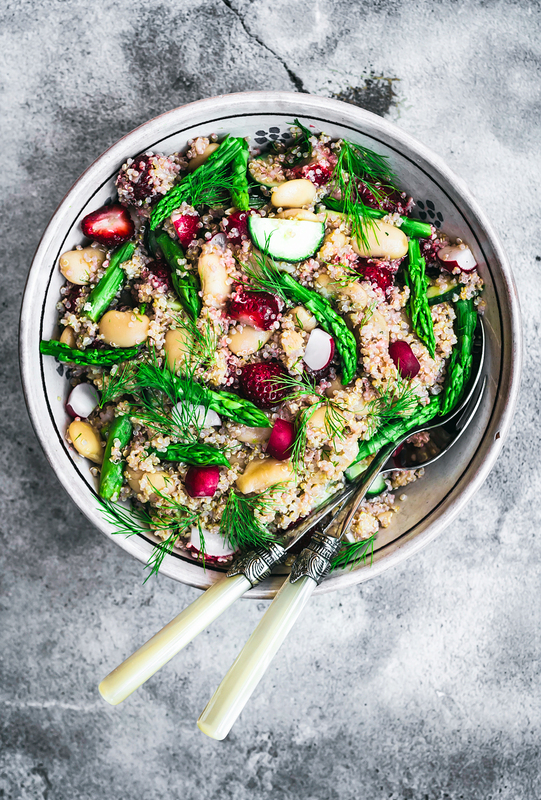 This spring-inspired vegan strawberry and asparagus quinoa salad is filled with the best of the season, featuring radishes, cucumbers, and dill alongside buttery white beans. Protein packed, gluten free, and perfect for a light dinner or packed lunch. Time seems to be moving more quickly than usual, like it usually does during the summer, and our Sweden trip is sneaking up on me. I feel like there’s a lot to do before then so I’m not swamped with work during a holiday – preparing content for this space, tying up freelance work, and sending all my emails ahead of time. Usually I try to keep things a bit more balanced with finishing up my work day by 6pm, but I’m writing this at 8:30, so clearly that’s not working out, hah. I’m also searching for a new apartment in Groningen so things are a bit bonkers right now. 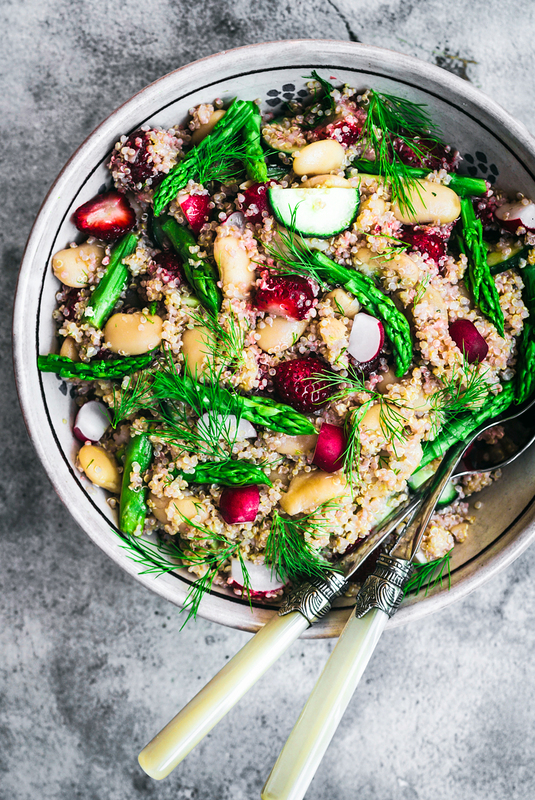 There are local strawberries, asparagus, dill, cucumbers, and radishes in this vegan quinoa salad – the only things I couldn’t get from the region were the beans and the actual quinoa. Isn’t spring the best? The dressing is a simple lemon mustard vinaigrette, but the dill pulls it all together, so don’t skip it if you can manage it. It’s a pretty straightforward recipe, but really using all the best stuff from spring. This is another great lunch idea or speedy dinner, even faster if your quinoa is cooked ahead of time. What I usually do for this, because you’ll usually want the asparagus to be lightly cooked (unless you can get tiny baby stalks & eat them raw) is toss the asparagus into the pot with the cooked quinoa. Here’s the deal. When the quinoa is done, or a minute out, turn off the heat and toss the chopped asparagus on top, then pop the lid on it. The residual heat will cook the asparagus enough to brighten the green and make it just tender enough without overcooking. Awesome, right? I just have one other quinoa salad recipe on the blog, even though it’s a staple in my house. The thing is, I’m usually a bit lazy about it, and just toss whatever I have in the fridge into it and call it a day. This is like a fancier version and it’s good. Let’s connect! Tag me on instagram @occasionallyeggs and #occasionallyeggs so I can see what you’re making, and stay in touch viafacebook, pinterest, and bloglovin. Cook the quinoa according to package instructions, and add the chopped asparagus for the last minute to cook slightly (see above). Remove the quinoa from the heat and let it cool for several minutes before mixing. Add the quinoa, asparagus, beans, strawberries, radishes, and cucumber to a large bowl. Mix the vinaigrette in a small jar or bowl, then pour over the salad. Stir to combine, and serve at room temperature or cold. Leftovers will keep in the fridge for a day, maybe two if the strawberries aren't too ripe. I hope you are feeling at home in Groningen. 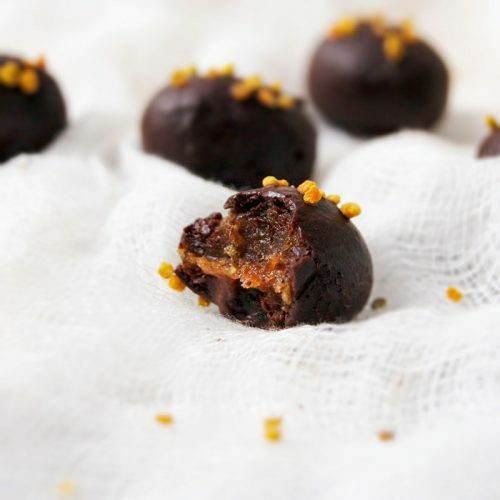 The new website design is beautiful and I love to see what recipes you come up with. I would like to ask you what foodprocessor you use. I own a Magimix Le Micro for many years now but yesterday the mixing bowl and lid have broken (I can buy them for € 25,00). It was a handy processor for small jobs but I’m thinking about buying a food processor with more power that will be able to blend nuts, make pesto, but which also can blend a quick dough, for shortbread or scones. I can’t afford a Kitchenaid and I don’t need to make very large amounts (not a big family) so I’m having a very hard time choosing a machine that meets the requirements. Do you have experience with foodprocessors? 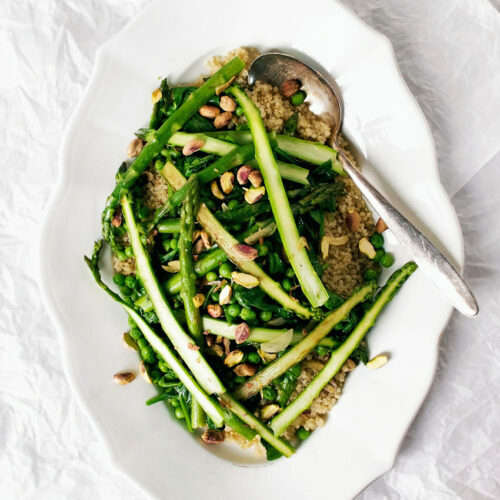 This salad looks amazing – and I love the idea of cooking the asparagus along with the quinoa – so easy!